"When you come to a fork in the road, take it." Sipadan Island has long featured on lists of top 10 dive destinations. And no wonder – the startling marine-life diversity on the island’s encircling reefs make every dive incredible. A more recent revelation is the equally spectacular macro diving around nearby Mabul Island. This is an ideal base from which to explore all the area dive sites, including Sipadan. Sipadan and Mabul are part of Malaysia, lying just off the east coast of Malaysian Borneo. Sipadan is a seamount, a half-square mile of dense coconut palm groves and white-sand beaches. A coral reef, which grew over an extinct volcanic cone, surrounds the island. In 2003, the Malaysian government designated the island and surrounding waters as a marine park, ordering the few resort operations on the island to leave. Because it is a protected area, the reefs around Sipadan have largely escaped damage from destructive fishing and development practices. These isolated, healthy reefs, surrounded by deep ocean, attract all manner of pelagics, plus lots of rays and turtles. Mabul, on the other hand, has a human population. Other than the employees of a half-dozen or so dive shops and resorts, its population of 2,000 consists mostly of friendly sea-gypsy families living in wooden houses on stilts. Mabul has neither vehicles nor roads on its 240,000-square-yard surface — an area that sounds huge until you successfully walk from one side to the other in full scuba gear and bare feet. Visitors remove their shoes on arrival and only slip them back on when they leave. While divers know Sipadan for big walls and big creatures, they come to Mabul for diverse macro life. This rare variety of marine life make Malaysian Borneo worth the arduous trip from the Americas and Europe. Plan to stay at least seven days – you’ll want to stay 70. Your reward will be sightings of whitetip sharks and (if you’re lucky) hammerheads, hawksbill and green turtles, reef and flamboyant cuttlefish, ornate ghost pipefish, frogfish, nudibranchs…pretty much any creature pictured on the pages of the iconic Reef Fish ID book. Sipadan and Mabul are in the Celebes Sea, smack dab in the middle of the famed Coral Triangle. The remote location means getting there is a slog. The first step is to fly in to one of the regional travel hubs of Kuala Lumpur, Malaysia, or Bangkok, Thailand. From there, jump on a cheap AirAsia or Malaysian Airlines flight to Tawau, the main city in southern Malaysian Borneo. From Tawau it’s a 90-minute drive to Semporna, a gritty fishing town from which you can catch a boat to the outlying islands. Area dive resorts and Semporna dive shops and hotels offer discounted or free transfers from the Tawau airport if you’ve booked in advance. A less-convenient option is to take a public bus into the town of Tawau, thereby traveling 12 miles (20 km) in the wrong direction, and switching to another public minivan to Semporna. This will add two or more hours to an already long journey. Instead of this headache, if you haven’t booked in advance, charm a fellow traveler into splitting the cost of a taxi. Alternatively, fly to Kota Kinabalu, the capital of Malaysian state of Sabah, before making your way south to Semporna. This makes sense for travelers who first want to visit the orangutan sanctuary, take a river trip, climb Mount Kinabalu, or just see the rest of Malaysian Borneo before diving. Once you arrive, Mabul, a mere 25-minute speedboat ride away from Sipadan, is a logical base from which to experience Sipadan as well as other area diving, including the thrilling macro diving around Mabul itself. Other options include high-end, all-inclusive resorts on nearby Kapalai or Pom Pom. With very few exceptions, the diving is accessible to divers of all levels, from freshly-minted open-water divers to the most seasoned dive pros. The calm, comfortable conditions are ideal for underwater photographers and videographers as well. Visibility averages at least 60 feet (18 m). Temperatures range from 82-86 degrees F (28 to 30 C), so a 3 mm wetsuit will do fine for most divers. Strong currents are rare, except for certain sites like Barracuda Point on Sipadan and (less often) Lobster Wall on Mabul. Most Sipadan dive sites are wall dives, bottoming out at what looks like infinity. If there is no current and the experience level of divers allows, guides often take groups into the blue for part of the dive, in search of hammerheads or other shy shark species. Along the walls and on top of the healthy reef, grey and whitetip reef sharks cast a curious eye. Hawksbill and green turtles snooze or nosh and bumphead parrotfish thunder by. Eagle rays perform their aerobatic shows, and a jumble of reef fish and corals make you feel like you’ve fallen into a kaleidoscope. On Mabul and the near-dozen other nearby islands, macro is the name of the game. Many sites are sloping coral reefs to a sandy bottom at no more than 65 feet (19 m) or so. Unlikely as it may sound, it is extremely common to see frogfish, blue-ringed octopus, flamboyant cuttlefish, ornate ghost pipefish, crocodile flathead — sometimes all on the same dive, but almost certainly within a full day’s diving. Most divers eat, sleep and dive with a local dive shop. Mabul and the other islands don’t have much in the way of restaurants and bars that are not tied to a dive shop, though some resident sea gypsies run little shops under their homes, selling chips and cigarettes and knick-knack souvenirs. (Please don’t buy the shells, coral or other “souvenirs” from the sea.) The exception is Semporna, where some choose to stay for a few days so that they can more easily reach the dive sites in the northern islands of Sibuan, Matabuan, Mataking, and others. As you might expect, Big John Scuba is run by a large Malaysian man called John. It’s a small, friendly shop that feels as though you’re diving and staying with a local family. BJ’s offers backpacker accommodation, meals, and a cozy atmosphere. 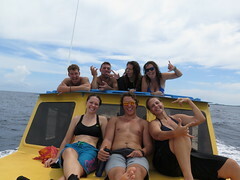 Members of the dive staff, mostly locals, all have eagle eyes. Scuba Junkie has accommodation and dive shops both in Semporna and on Mabul. It’s an efficient, professional operation with a mix of Western and Malaysian staff. The shop is dedicated to marine conservation. Among other activities, it employs a conservation specialist, runs a turtle hatchery on Mabul, educates the local population about marine life and conservation, and organizes weekly beach cleanups. Full disclosure: The author worked as a Scuba Junkie divemaster for six months. Sipadan Scuba is another responsible, well-run dive shop. 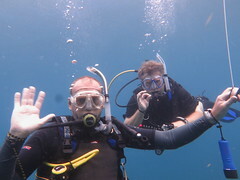 Its biggest attraction is an Advanced Open Water PADI course that includes Sipadan dives. A slight step up from other options, Sipadan Water Village Resort on Mabul has some over-water bungalows, more luxurious decor, and a nice cocktail bar, which is open to non-guests as well. This article first appeared on Scuba Diver Life. Ever since Jacques Cousteau described the reef encircling Palau Sipadan as an “untouched piece of art,” divers have flocked there to experience its overwhelming diversity of marine life for themselves. 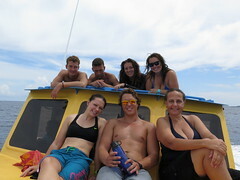 Those divers know that any trip to Sipadan isn’t complete without at least one dive at Barracuda Point. Barracuda Point is the exception that proves a cardinal rule of dive sites: If the name includes a sea creature, i.e. Angelfish Alley or Crab Corner, that creature is unlikely to appear during the dive. While the near-certainty of seeing a hundreds-strong tornado of chevron barracuda is the defining feature at Barracuda Point, you’ll see plenty of other life as well. For starters, a giant school of jacks hangs out at the top of the wall near the site’s entry point. As you descend through this cloud, look out for a stampede of bumphead parrotfish storming the reef. The wall itself, which extends down hundreds of feet, is alive with vibrant soft and hard corals. Nestled along the wall is an almost comic diversity of reef fish, and nudibranchs of all shapes and colors. Spiny lobsters tuck into small crevasses, and the occasional green or hawksbill turtle snoozes on larger ledges. As on all Sipadan dives, keep an eye on the blue, where you might spot gray reef or whitetip reef sharks cruising by. About 15 to 20 minutes into the dive, you’ll encounter a channel cutting through the wall to the right. Depending on the current, you might find a swarm of reef sharks here at around 65 feet (20 m). The barracuda tend to be much shallower at around 40 feet (12 m), and can congregate anywhere along the channel. If the current is ripping, position yourself close the swarm, grab hold of the rocky bottom, and enjoy the show for as long as your deco time and air supply permit. When it’s time to let go, shallow up along the wall on right side of the channel, watching for gray reef sharks resting along the sandy bottom, or the odd eagle ray buzzing by. The channel and sloping wall are full of macro life as well, should you care to slow down and search for leaf scorpionfish, pipefish, crabs or commensal shrimp galore. Complete your safety stop along the top of the reef, which sits conveniently at around 16 feet (5 m). Peek under the abundant table coral and you might find a juvenile shark hidden in the shadows, but beware the titan triggerfish guarding its territory.